How do I thank my donors as a peer-to-peer fundraising team captain? Head to your Personal Dashboard by selecting the Dashboard tab in the top navigator. If your Personal Dashboard is not your default dashboard, toggle to your Personal Dashboard from the dark blue bar at the bottom of your screen. 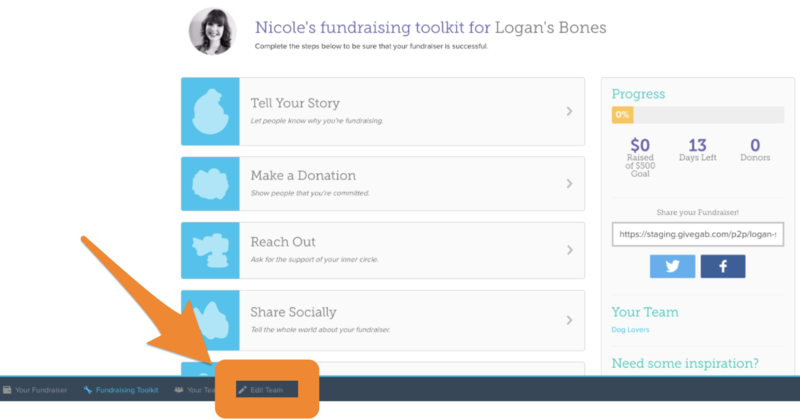 From there, click on the "Toolkit" button beneath your Personal Fundraiser. From the blue bar at the bottom of your screen, select the "Edit Team". From there you'll be taken to your P2P Fundraising Team Editor. Let your donors know how their contribution made an impact, by sending them an email right from this page or mark them as thanked if you showed your appreciation another way. To thank a donor, check the box next to their name. To thank all of your donors at once, check the box at the top next to “Name”. Then click the box titled “Thank Selected Donors”. Once you've clicked the "Thank Selected Donors" button, you'll be prompted to craft your thank you email. You can either personalize your thank you, or use the pre-set thank you message. Click on the “Send Thanks” button and your donor will receive an email from you and your team thanking them for their donation. After clicking “Send Thanks” you’ll see that your donor now has been marked as thanked in your Team Editor.